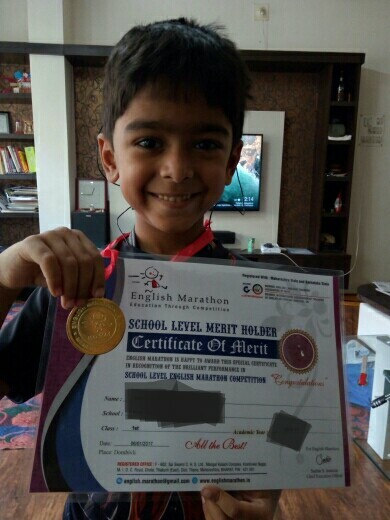 Aarav's journey to hearing......: English marathon!! Last year, Aarav was preparing for a Grade 1 level English marathon exam. Studies were going quite well but I knew that we would need an aggressive revision before the exam. Aarav, however fell in school and broke his right hand 3 days before the exam. He is right handed and needed to write for the exam, I had pretty much let it go..
We spent two days in the hospital.. Two days at home acclimating with the plaster life.. That was the 9th,10th,11th and 12th. The exam was on the 12th in the afternoon. Now with all that was going on I did not expect him to be at all interested in the exam, but he was! So, I spoke to the institute of they could get a writer.. After getting the writer we gave the exam and forgot all about it. It did not even excite us when the results were out. I did not expect him to even pass, let alone get good marks at all. Yesterday, we got the mark sheet and certificates, Aarav scored a good 74% in the exam. That's a distinction!! Aarav is full of surprises and his will power and drive is inspiring!! Get up, dust it off and power on!! No matter what.